A joy to admire and hold, the handle and scabbard fittings are beautifully finished with antique gold and black. 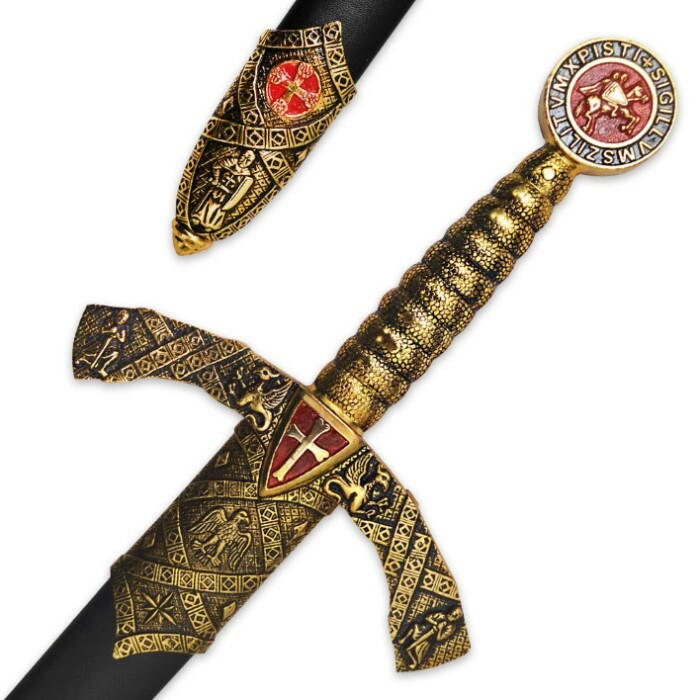 The Seal of the Knights Templar is prominently displayed at the top of the handle, joined by their cross shield located at the center of the guard. Features include a mirror polished stainless steel blade, hardwood scabbard with metal fittings, and intricate designs throughout. 32 1/2 in, blade, 42 in. overall. The sword is more than I expected. Beautiful craftsmanship and very well made. Excellent experience with True Swords. Received this sword in less than a week. Will be shopping here again. For the reduced price, it is a good buy. The blade is not sharp since the sword is meant for display purposes only. Nice detailing on the handle, hand guard, and scabbard . I would not classify it as a broad sword, since the blade is not very wide. The scabbard is not made of metal, rather wood covered in leather. 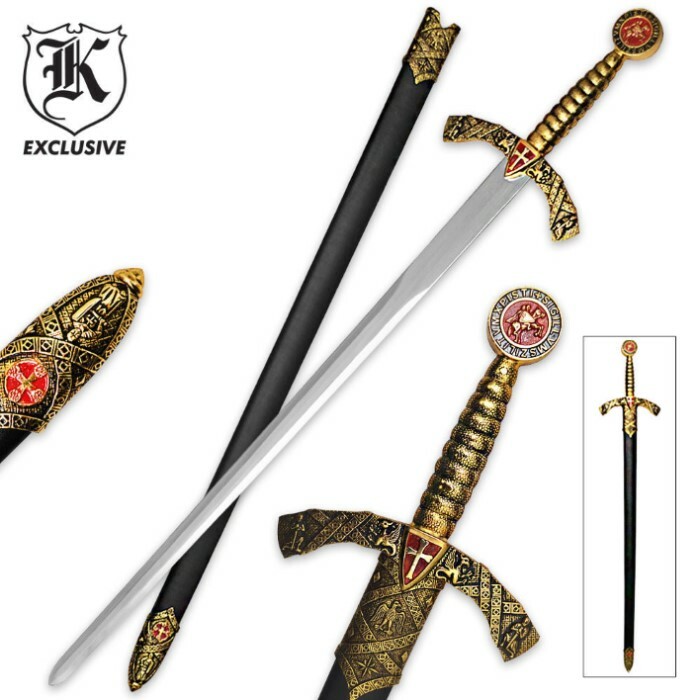 I have purchased many swords from BudK, and I would recommend this one as a very nice decorative piece. You might also check out the Sword Of Camelot, which is, in my opinion, one of the better buys here at BudK. Would like to see more new ones, Clint, since I have purchased pretty much all of the ones I liked already. THANKS BudK for all of the fine cutlery products you offer at reasonable prices. Just received this sword today. Met and surpassed expectations. I have purchased other swords like this that seemed to be a good deal at a good price that were extremely poor quality. This is everything but, and I definately recommend. Absolutely beautiful. Doesn't come sharpened but I never want my blades sharp when I get them. Very vibrant colors and good weight.